Wake up, slip into day clothes, brush teeth, shower, comb hair and apply make-up, scoop muesli and pour milk on top, then eat. It takes on average less than 45 minutes to get through all these activities and most of us do them on auto pilot, meaning we don’t even think about it. In fact, the sequence of moves and rituals is always the same. For example check yourself in the shower: without exception, the series of movements and order of steps is always the same, including the way the arms slide around the body to rub the soap all over. Because all these rituals happen so fluidly due to habit and ease, we ignore how lucky we are to be able to perform them so easy. By becoming aware these skills are not a given but a privilege, we come one step closer to gratitude and one step further from depression. Being an over-thinker, I often tend to fixate on a certain less than perfect aspect of my life and obsess about it until I can correct it, which takes a lot of energy. It’s so easy to drift into frustration because the day job is not particularly fulfilling at the moment or because those 3 extra kilos that were challenged and fought against all spring didn’t budge and it’s almost July. And it’s amazing to see how for someone else, managing to finish a bowl of soup without help and with minimum spillage is an achievement that calls for celebration. Quirk Heaven applauds the inventions that improve life of the physically unprivileged people while casting awareness to the rest. This is Liftware, the cutlery designed to give back the freedom of eating unassisted to those affected by hand tremors. This is the easy to use tool that helps disabled people with food spilling, allows them to feel more secure when eating in public and replaces the straw as means to manage a bowl of soup. How Liftware Steady works: the handle contains an engine that picks up the tremor trajectory and frequency while neutralizing it by creating a counter tremor. Everything happens at millisecond level to achieve 70% reduced shaking, thus allowing more control over scooping and spoon coordination. 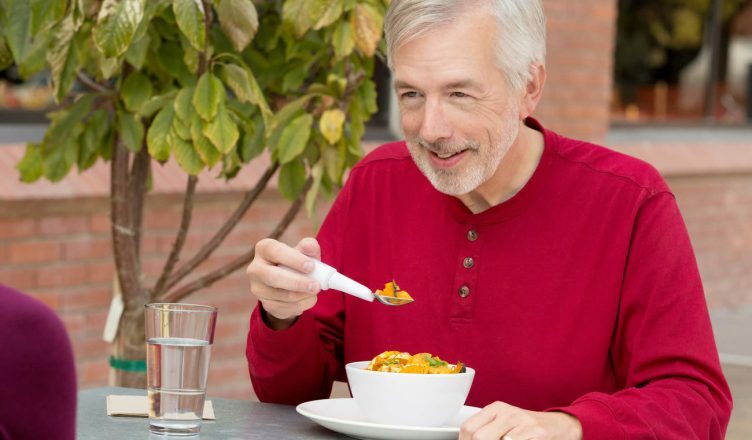 The Liftware Steady makes self feeding possible again for people suffering from Parkinson and other mild to moderate hand tremor resulting conditions. The spoon is rechargeable and reportedly lasts for about 4-5 days until the next charge. The same company developed Liftware Level, the cutlery inspired by chickens’ ability to keep their head in fixed position despite their body movements. This spoon addresses another category of disabilities, mainly cerebral palsy, spinal cord injury, Huntington’s disease etc. As Level is very new, there are not enough reviews to make out a comparison with Steady, which would be very handy considering they cost the same. If you’ve ever had your writing hand immobilized and had to hold the spoon with the other, you know for sure what this struggle is all about. Bottom line: I believe those in need should be supported by their health plan to be able to afford these devices. Until that becomes the case, Quirk Heaven encourages everyone who suffers from hand tremors and limited manual control to try it: order and use it for 30 days and if it doesn’t work out or you can’t afford it, simply return it and put it on your wishlist.